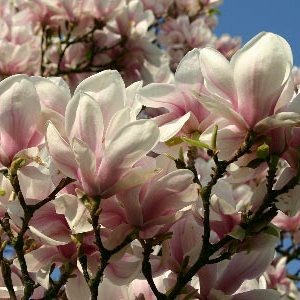 Probably the most widely grown Magnolia in domestic gardens, its beauty, although fleeting, keeps it being planted regularly and its presence as a large tree in many places throughout the country is a testament to its hardiness over many years. It is a primary hybrid between two wild species, M. denudata and M. liliflora and was made in 1820 in France by Etienne Soulange-Bodin after whom it is named. Introduced into Britain by 1827, this would be one of the first magnolias most English people would have seen. The floral magnificence comes with a couple of problems however. It flowers early on bare stems and sometimes a hard frost in April (which is very likely in the English Midlands) can leave the buds scorched brown. The petals fall quickly to make a coating of pink at ground level that soon turns to brown and can smother delicate low growing bulbs and herbaceous plants beneath, and the large leaves cast heavy shade through the summer and again make an impenetrable layer in the winter. Despite all that, those of us lucky enough to have a magnolia in the garden tend to forgive them in return for the floral extravaganza in spring!